One gardening and agriculture project will sprout to life courtesy of a $1000 grant. Local outfitter Alternative Apparel, whose flagship store is located on Abbot Kinney Boulevard, wants to harness your penchant for horticulture. The Alternative Apparel Grants Project, which is in its maiden year, is offering $1000 to one community-minded venture that will promote gardening and agriculture in Venice. Through the Grants Project, which is the brainchild of new hires Erik Joule and Orondava Mumford, the eco-friendly clothier is hoping to become more engaged with their clientele and to foster community-proposed projects. 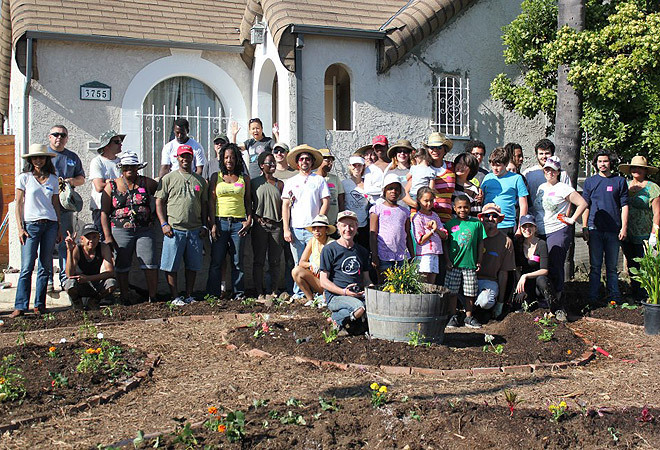 The theme of the inaugural grant was inspired by Ron Finley, an L.A.-based “guerilla gardener.” Along with a group of volunteers from his program, L.A. Green Grounds, Finley seeks to serve low-income residents in South Central Los Angeles by helping them plant edible gardens in their front yards. Alternative Apparel Grants Project proposals are due no later than midnight PST on May 16th. You can submit your idea on their website, on Facebook, or in-store. Each entry will be presented at a soiree hosted by Finley on May 23rd, and a winner will be chosen by the guests in attendance.